Farshad Adib, MD, is an assistant professor of orthopaedic surgery at the University of Maryland School of Medicine who focuses on the care of both pediatric and adult patients with hip and knee disorders. 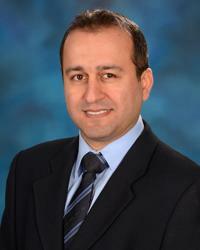 Dr. Adib specializes in sports medicine and total joint replacement. He has extensive experience with minimally invasive surgical options, including direct anterior hip replacement surgery, impingement surgery and hip arthroscopy. Dr. Adib has special interest in hip pain in young adults and offers hip preservation surgery, labral repair, periacetabular osteotomy (PAO, Bernese osteotomy), hip dysplasia surgeries and surgical hip dislocation surgery. He also performs knee ligament reconstruction, meniscus repair and knee replacement surgery. He enjoys treating pediatric conditions including: ACL tears, meniscus injuries and hip dysplasia. After graduating from the Tehran Medical Branch of Azad University in Iran, Dr. Adib completed his residency in orthopaedic surgery at Akhtar Hospital, Shahid Beheshti Medical University, also in Iran. His training continued with four different fellowships: sports medicine and hip preservation at Harvard Medical School; sports medicine at Nirschl Orthopedic Center, Virginia Hospital/ Georgetown University; and adult reconstructive surgery at the University of Virginia. Dr. Adib also served as the Medical Director at the Inaugural Across the Bridge 10K Chesapeake Bay Run, and was a Finish Line Physician for the Boston Marathon in 2013, 2014, 2015 and 2016. His research interests include anterior hip replacement, prevention of infection in total joint replacement, hip preservation surgery, complications after hip arthroscopy, periacetabular osteotomy, gluteal compartment syndrome, external snapping hip syndrome and iliopsoas syndrome after hip arthroscopy and validity and comprehensibility of the activity scales in injuries. Dr. Adib is the author of several peer-reviewed scientific articles and book chapters on the topics of hip arthroscopy and other hip and knee surgeries. In addition, he has presented his research at national and international conferences. Dr. Adib speaks fluent Farsi. The UM Department of Orthopaedics believes in transparency in the reporting of external professional relationships of faculty members with healthcare-related businesses. Dr. Farshad Adib disclosed the following external professional relationships.